A sterling silver necklace featuring a silver leaf with two dainty drop pearls set either side, one pearl is white and one pearl is soft pink. This sterling silver necklace would suit any lady who enjoys something that is different .The leaf has been hand crafted out of sterling silver and designed with soft curves and femininity, beautifully complemented with two pretty pearls. The Autumn Leaf necklace sits on a sterling silver snake chain which is 41cm in length and can be extended to 46cm using the extender chain. This pretty ladies silver necklace is hallmarked in the UK and designed to be graceful and refined. 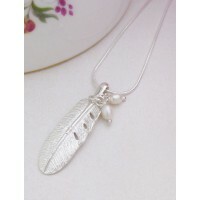 The 925 solid sterling silver leaf features two drop pearls. The snake chain measures 41cm in length and can be extended to 46cm.